Deadly stuff man, your likenesses & exaggeration are awesome. A question: are you using pencils of varying colours for these, or 'tinting' them in Photoshop? These are great Chris. I especially like the contrasting line weights on the inked caricature. I've been influenced by your pencil work when I try caricatures, but I never seem to get the range of values that are so masterful in your drawings. I'm gonna have to commission a caricature one of these days. So awesome man. I've seen a lot of caricatures, but I've come to totally prefer yours. Seriously amazing. I love the B&W line drawing. Yours is seriously some of the best linework I've ever seen. Also really like the fat guy (second to last), but they're all awesome. I love the way you're able to convey so much depth and form with minimal shading. Anytime I try to do that, I end up piling on layers and layers of tones and it still never looks right. You seem to know just the right spots to put all your shadows, and nowhere does it seem over- or under-worked. I'd love to hear about your approach to doing caricatures (e.g., how you choose what to exaggerate, how you blend the realistic and cartoony elements, etc.). thanks for the Pepsi Character design tutorials, i really appreciate. good stuff as usual! Everyone is their worst critic, that's why leave the jujement to others:Awesome caricatures, Chris, Bravo!!! You're just too damn good!! !...glad to see you're stretchin' again...missed seeing this stuff from you!!!! Thankyou all for the kind words and encouragement. Very much appreciated. Mike- Thanks. Yeah, just tinting them in Photoshop. Graphite's easier to erase mistakes than coloured pencils. Adriana- Thankyou, I'm glad you like it. My caricature of you isn't very flattering. It was more an experiment in extremities. Sop I was very wary about posting it. Glad you weren't too offended. Ryan- Thanks man. I've had plenty of requests for a more thorough caricature tutorial, so I'll definitely keep that in mind for my next tute. bangalore_monkey- Thanks for the caricature. It's great!! LOVE these. the back of the head view is funny. Thanks Nathan! Enjoyed visiting your blog. Great caricatures - I'd love to see pictures of the actual people to compare them to, too. danshultz- Thanks. 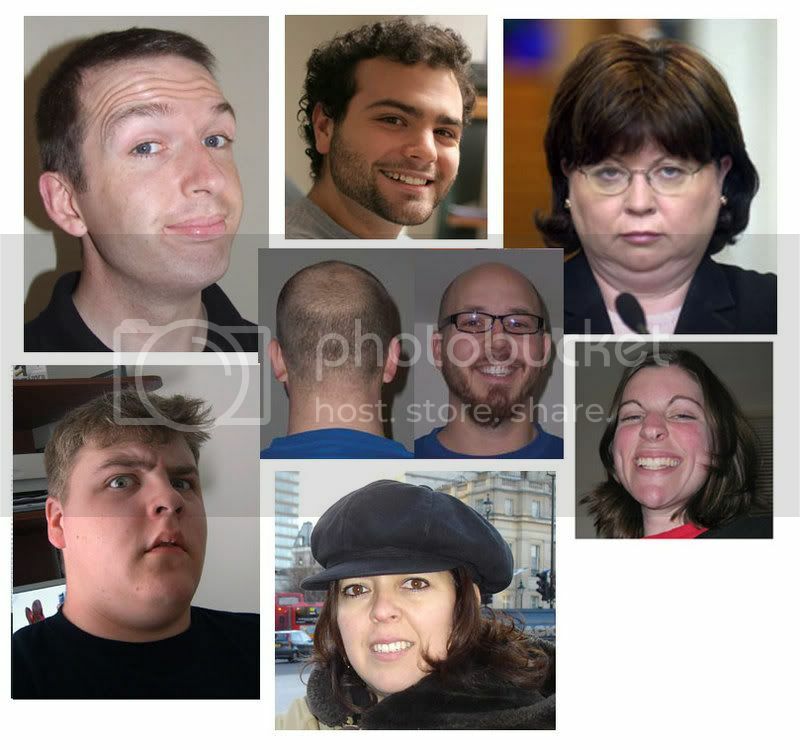 There's a link to the photos just above the first caricature. hey, somebody called me "the fat guy"
William- I'm sure when he said 'fat' he meant 'very talented'.